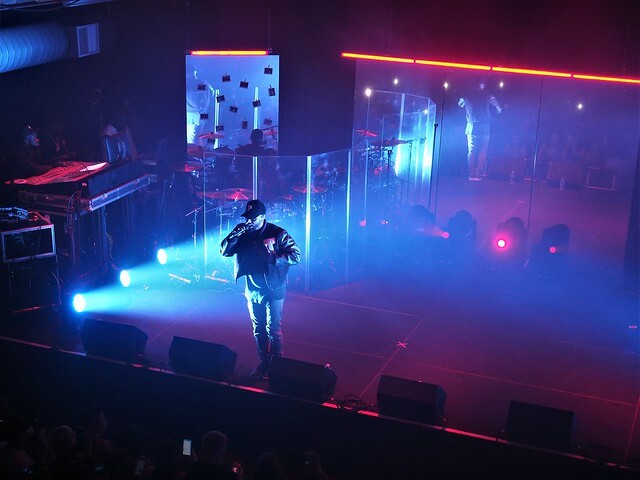 Louisville’s own Bryson Tiller played a sold out, all ages show at Mercury Ballroom last week. Tix were gone hella fast but Live Music Lou was “in the know” and snagged a couple. Mercury was packed to the brim and were ready to sing along to Bryson Tiller jams for about an hour and a half. It seemed that many had seen the artist before; we were not part of the group, not being able to get tickets to his last Palace show. The layout of the stage included an extension out into the crowd. It wasn’t ideal for picture taking, as there was no pit, but it did bring Tiller to the people…which was ultimately the point of the evening. I know a handful of Bryson’s songs but in no way will admit to being a super-fan or anything, which most definitely put me in the minority. People were PUMPED to see him. There were lots of young ladies screaming and folks singing along with him…for every. single. word. We got a special surprise as the night was closed out with an appearance from Yo Gotti. The crowd, to be honest, was very young; Brittany actually saw one of her former student at the show (shout out to Adriana – so proud that you’re doing so well!). There was also a large section upstairs that was only family, close friends and people involved in the production of this new album. They were loving the night as I’m sure it almost honors them as much as highlights him. The tour is called Trap Soul Series but the big stuff is coming up. At the end of May, he released his sophomore album, True To Self, which has since hit #1 on Billboard, and he’s announced an extensive tour that will culminate here in Louisville at the Yum! Center in September. A lot of people like to give Tiller a hard time for overplaying his Louisville ties and not really being a true, committed Louisvillian, but he definitely has preferential treatment for the city. Check out the rest of Britt’s photos here! Cool fact, Britt was one of only 2 photographers at the show…so these are EXCLUSIVE!